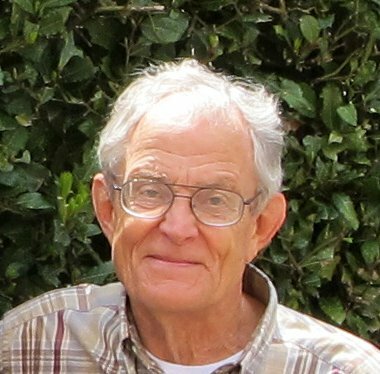 Leroy Kubel is one of the club’s founding fathers. He is a charter member and in fact was our first president. 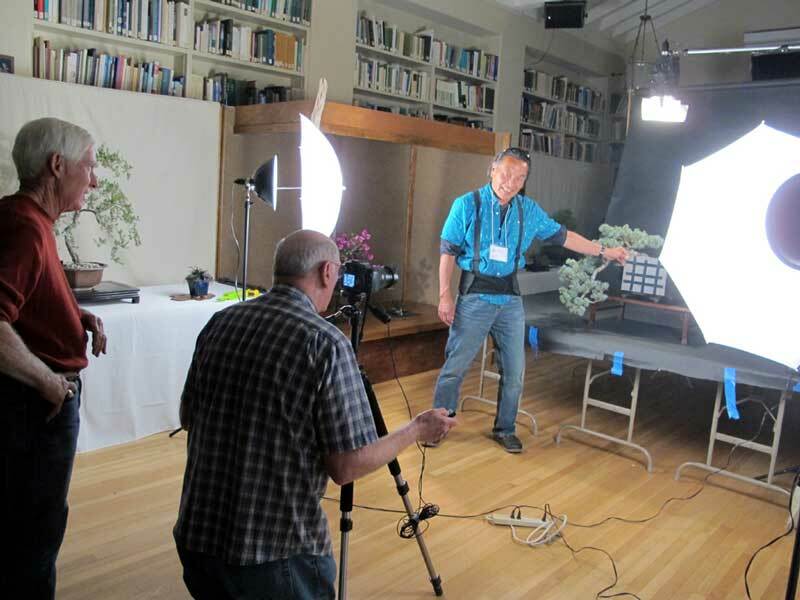 That’s Leroy behind the camera at last year’s show at the Botanic Garden, with Steve Iwaki, assisting and Tom Post advising. For as long as anyone can remember he has taken excellent photographs of the club’s annual show. With the introduction of digital photography and with the help of his trusty Mac, Leroy has taken his annual presentation far beyond a carousel full of Kodachrome slides. He has added people, videos, clever graphics, music, events other than the show, and usually a surprise or two. His presentation is always a delightful don’t-miss event! Spring has really sprung and things are growing like mad. I can’t keep up with all the pinching, pruning, and clipping that my trees are begging for. Oh, well, at least they are green and healthy–most of ‘em anyway. I hope that you have picked out a tree or two to groom for our really big shew which is coming up fast. It’s next month folks! If you have a tree you’d consider entering but don’t have a stand, don’t let that stand (pun intended) in your way. Ann Erb has always been generous in loaning out one of hers, and other people often have a suitable extra one you could borrow. Just ask. Having written this short paragraph I can now go back outside to deal with the rampant spring growth of my trees while Ernie has to sit in front of his computer to bang out the newsletter. I did it for many years and now it’s his turn. He’s off to a good start, I think. I like his new feature of highlighting an different member and one of his or her trees each month. Last Month : Ann Erb To The Rescue! What happens when a professional bonsaist spends all his time and money on his nursery? His car breaks down. Bob Pressler was supposed to be our monthly presenter, but he couldn’t talk his car into making yet another trip north, so bonsai instructor Ann Erb, the Club’s Show Coordinator, filled in, demonstrating on two trees she had just purchased a few hours earlier at Terra Sol, as Past-President Tom Post ran home to get some tools. Ann first carefully pruned the Vulcan Magnolia — which she learned from watching Star Trek (kidding) — so as not to take off too many flowers. She did tell us to put routing compound on all cut branches, which aids in making callouses. The Jade had a great trunk. 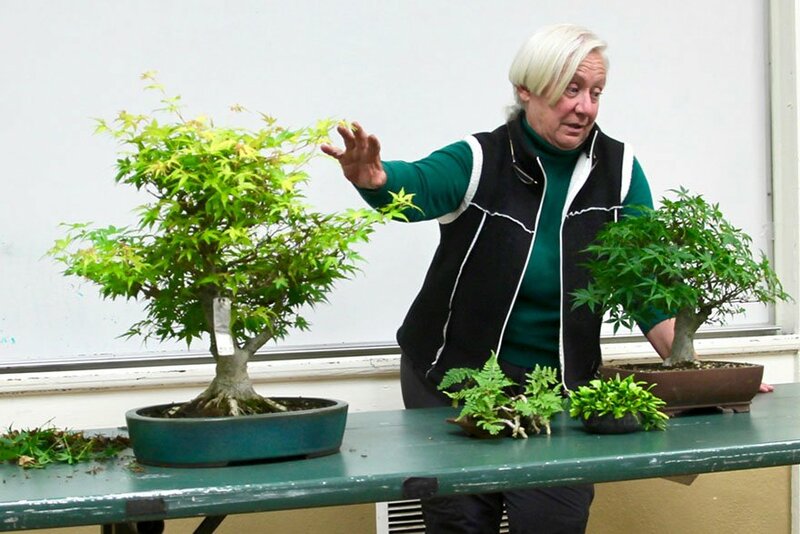 “Anything can be an interesting bonsai, but it has to look like a tree,” Ann said. Allan Hemmy brought in a Red Pine that he had just purchased at Muranaka’s Nursery in Nipomo. It had some tall candles and Ann suggested that when candle pruning to keep the candle length below the height of the first needle. One way to tell if it is a Red Pine is look at the buds. They are red, not white like on a Black Pine. Finally one club member — me — brought in his new boxwood to show, because Bob Pressler’s program was to be on boxwoods. Ann offered to look it over. “Feel free to do some pruning on it if you’d like,” I said. Ann smiled, then cut off a chunk of a size large enough to produce an audible gasp. “A shorter tree looks older,” she explained. “A tall thin tree looks young.” It reminded me of the “good ole days” in Ann’s Adult Ed workshops when we were all thrilled when she made large cuts — on someone else’s tree. But, of course, my boxwood did look much better when she finished and it did seem older. It was also a bit lighter to carry home. Ann prunes her Jade after finishing her Magnolia. 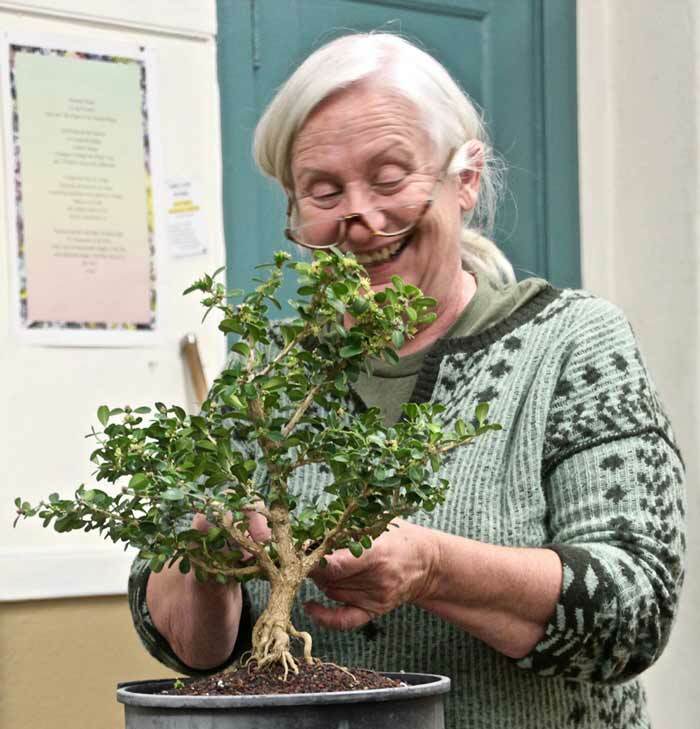 Ann happily prunes my boxwood. 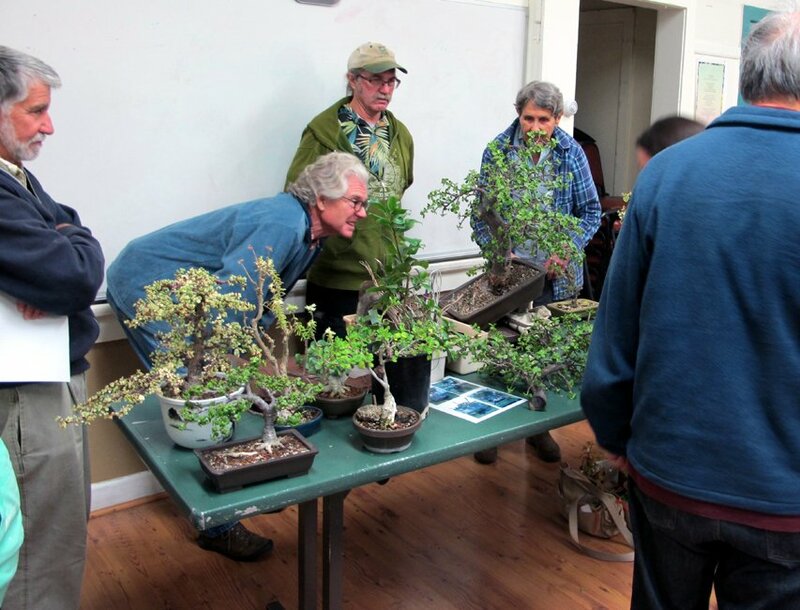 American Bonsai Association, Sacramento: Annual Spring Show at the Shepard Garden and Arts Center in McKinley Park, 3330 McKinley Blvd, Show hours: Saturday, 10 AM – 5 PM, and Sunday, 10 AM – 4 PM, with demonstrations by headliner Jonas Dupuich at 1:30 PM both days. Beginner workshop Sunday morning from 10 AM – Noon. Large member and vendor sales area, plenty of free parking, and free admission. Benefit drawing Saturday and Sunday includes bonsai, bonsai related items, and that days demonstration tree. 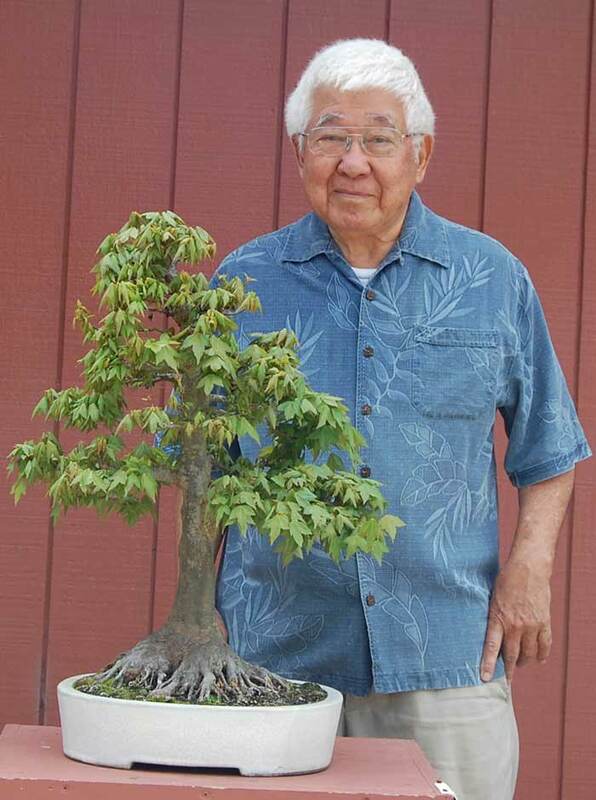 For additional information contact Renee Seely: (916) 929-2106 or breadcrust@comcast.net or visit abasbonsai.org. Santa Cruz Bonsai Kai: 29th Annual Show at the Museum of Art & History, 705 Front Street. Show hours are 10 AM – 5 PM both days with demonstration at 2 PM. 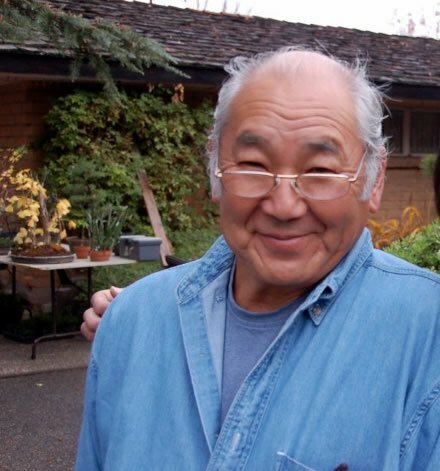 Saturday’s demonstrator is Eric Schrader and Sunday’s will be Mr. Katsumi Kinoshita. Demonstration tree and trees prepared by club members will be part of the raffle each day after the demonstration. Sales area will include quality vendor and member trees, pots, and other related bonsai items both days. Admission price of $5.00 includes the Bonsai Show as well as admission to all the Museum exhibits. For more information contact Ed Lambing at edinbonnydoon@comcast.net. 2nd Annual Köen-Nai No Bonsai Fundraiser for the Clark Bonsai Collection at Shinzen. Enjoy a wonderful bonsai weekend in the beautiful setting of the Shinzen Garden at Woodward Park, at Friant and Audubon Roads. Hours are Saturday 9:30 AM – 5:30 PM and Sunday 9:30 AM – 4:30 PM. Peter Tea and David Nguy will provide demonstrations for this event. The event will include a huge bonsai auction with a wide selection of trees, complimented by a mammoth vender area. 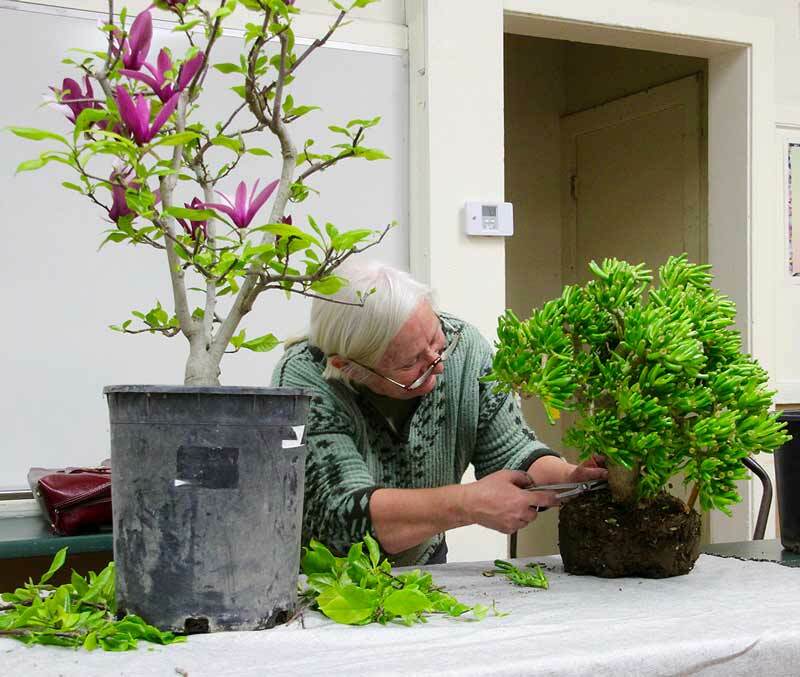 Toko-Kazari Display Competition will provide beautiful artistry together with tours of the Regional Bonsai Exhibit in the garden. Several Shohin workshops will be offered. For more information, contact Bob Hilvers at bonsaigui@comcast.net. 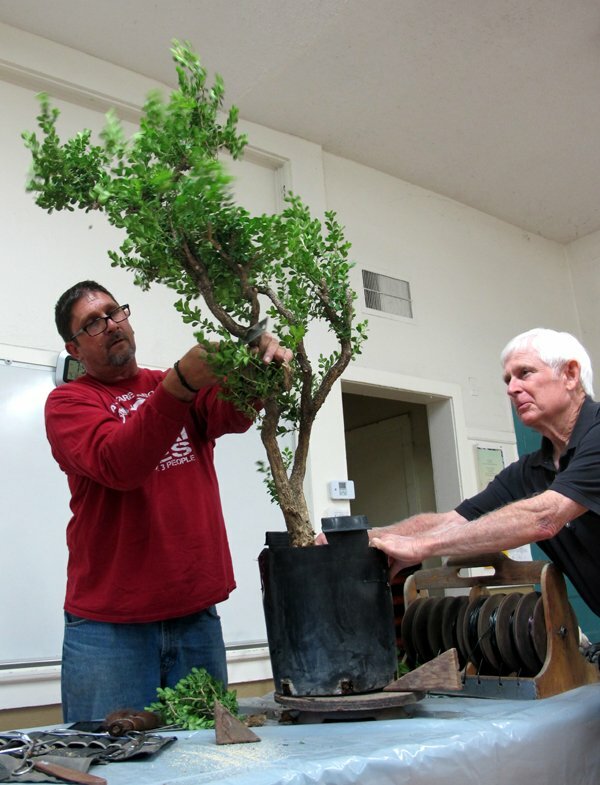 San Diego Bonsai Club: Spring Bonsai Exhibition at the Casa Del Prado, Room 101, Balboa Park. Show hours are 10 AM – 5 PM both days with demonstrations at 11 AM and 1 PM. Free admission. Bonsai pots, trees, and other bonsai-related items for sale. For more information visitsandiegobonsaiclub.com or contact Janice Hale. I got the trident maple cutting at our monthly club meeting 15 years ago. Two years after I got it to root, I transplanted it into a porous 1 gallon container. During the transplanting I carefully spread out the root flat knowing that I wanted good rootage (nebari) in the future. Maybe about the fourth year I transplanted it into a 5 gallon container. About the 7th year, I asked for direction and Susanne Barrymore said that in Feb (while still dormant) I should cut all the roots from the bottom and make it flat. Every year in February, for the last 7 years, it has been transplanted and root pruned with the goal of improving the rootage on the surface. 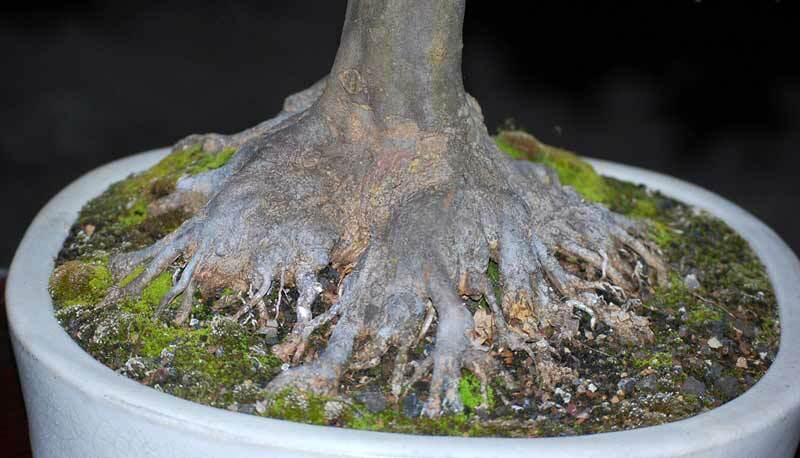 The trident maple sends out new roots profusely. The trunk was developed to 3 inches diameter via a few sacrificial branches. It was potted in a bonsai pot for the last five years. From a cutting 15 years ago to a happy, healthy tree.